For the fifth year in a row, graduation rates have improved in the Crook County School District. "We are extremely proud that Crook County High School is second only to Culver High School in the Central Oregon region," said CCSD Curriculum and Special Programs Director Stacy Smith. The four-year cohort graduation rate in CCSD was 78.1 percent for the 2017-18 school year, up from 72.13 percent the previous year. "We are very proud of the continued improvement over the last five years," said CCSD Superintendent Sara Johnson. "Every student needs to graduate from high school, and we will continue to focus our efforts to ensure all graduate career and college ready." This week, Oregon Department of Education released the graduation rates for all Oregon schools. Like educational leaders across the state, the administration team at CCSD is looking at this data and comparing it to previous year's data to look for areas of improvement as they strive toward their goal of 100 percent of their senior students graduating high school, career and college ready, Smith said. The four-year cohort graduation rate at CCHS was 92.44 percent, up from 90.06 percent the previous year. Only Culver High School was higher in this region with 95.12 percent. Summit High School graduated 91.63 percent. Redmond High School was the lowest traditional high school regionally, at 75.4 percent. "We applaud the hard work that our students and families, along with the Crook County High School staff, undertake in order to get these students the skills they need to graduate," Smith said. "We are very pleased with the continual increase at CCHS. Staff, students, and parents are continuing to work hard to ensure that every student is successful," said CCHS Principal Michelle Jonas. "We will continue to modify our student support systems so that no students falls through the cracks in regards to graduation." This year, students who attended Crook County alternative schools improved their graduation rate from 30.23 to 50.88 percent of seniors graduating in four years. This rate includes students from the "at-risk" student populations that attend Rimrock Adolescent Drug and Alcohol Treatment Facility, Central Oregon Intergovernmental Council, and Pioneer Alternative School. "This makes Crook County alternative school programs one of the premier alternative programs in the state of Oregon," Smith pointed out, noting that the district is working hard to improve the graduation rate for these students. Marshall High School, an alternative school in the Bend-La Pine School District, had a 44.59 percent graduation rate. "We attribute Pioneer's significant graduation rate increase to the continued effort by staff to build positive relationships and supports for each and every student," said CCSD Director of Student Improvement Joel Hoff. "Although we saw a significant increase in our district's graduation rate, we will continue to focus our improvement on supporting the students at COIC, Rimrock and Pioneer," Smith added. "We continued to refine and modify our student support systems to benefit those students that were highly at-risk of not graduating." 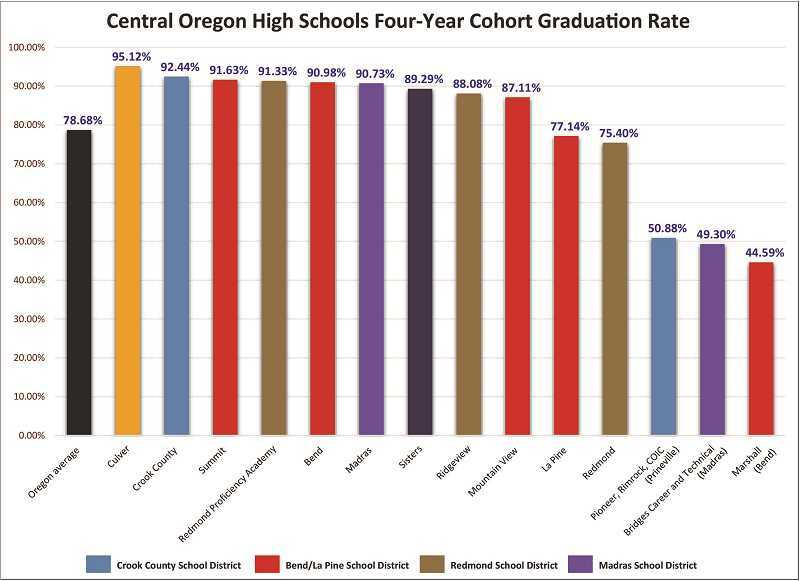 Of the six school districts in the Central Oregon region, CCSD ranked fifth for districtwide graduation rates. Culver was highest ranked, followed by Sisters, Redmond, Bend-La Pine, Crook County and Jefferson County. "In spite of our recent success over the last five years, we still have work to do," Smith said. "We are proud of the work we have accomplished but will continue to look for opportunities to improve until all students graduate."